Pipeline allows you to set commission split thresholds for agents and be warned when they are about to surpass their thresholds. Warnings appear directly on the surpassing transactions so admins can adjust agents' commissions at exactly the right time. A commission split threshold represents the dollar amount at which an agent’s commission generated for the brokerage should result in a commission split change. To enable the commission threshold warnings for an agent, enter a commission split threshold. Click [Manage Users] from the left menu. Click the name of the agent to edit their user profile. Enter the dollar threshold into Next Commission Split Threshold field. This should be the dollar amount of this agent's commission paid to brokerage, beyond which this agent's commission split will be increased. We will use this number to alert you during CDA generation. During CDA creation, Pipeline will display a warning when there’s a possibility an agent on the transaction may surpass their commission threshold. Click [Manage Commissions] from the left menu to begin the CDA generation process. Complete the first step of the CDA generation process, entering escrow, sale, total commission info, etc. 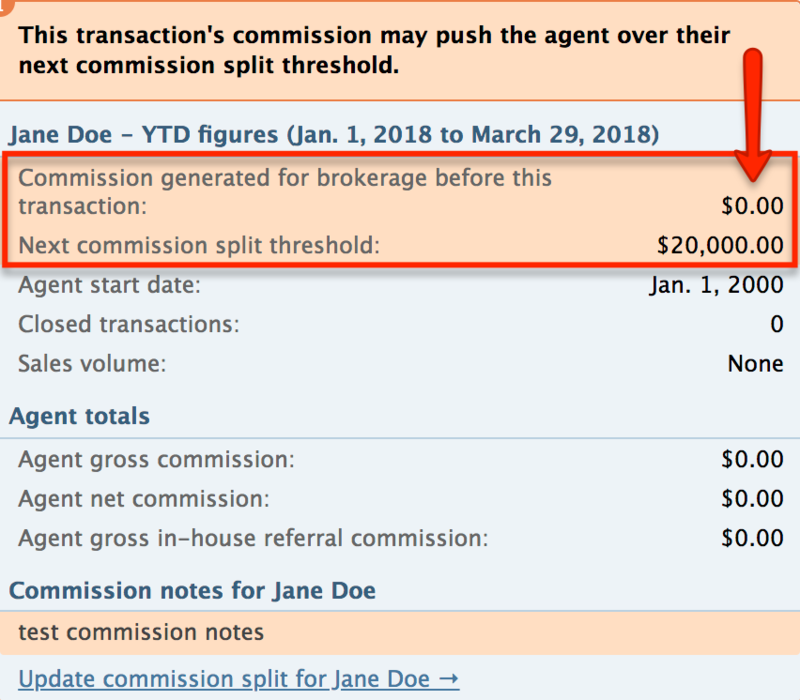 In the next step, if there are any agents on the transaction who may surpass their next commission split threshold, Pipeline will highlight the agent’s information on the left side of the page. Highlighted warnings will also appear in the agent’s YTD summary box that appears on the right whenever you hover or click on the agent’s info. Highlighted warnings will also appear in the In-House Referral section for an agent whose in-house referral commission may cause him to surpass his commission split threshold. Pipeline will display highlighted warnings when an agent may surpass their threshold based on the agent’s split, commission amount, and other system assumptions. Check the agent’s final commission for the transaction to determine if they will, indeed, surpass their threshold on that transaction. If so, adjust their commission based on any thresholds crossed. An alert will be displayed after a CDA has been processed for for an agent who has surpassed his threshold. Follow any links to update the agent’s Commission Percent and Next Commission Split Threshold and prevent the alert on future CDAs for that agent. Q: Why do warnings appear sometimes when an agent has not surpassed his threshold on a transaction? A: Pipeline uses an agent's commission split percentage (if one exists), the amount of commission/referral on the transaction, and other assumptions to determine if an agent may exceed his threshold on a transaction. If those calculations lead to a commission amount for the agent that is close to or exceeds their threshold, Pipeline will display the highlighted warnings so the admin can make a final determination based on the final commission amount for that agent. Q: An agent on a transaction will be surpassing his threshold, but Pipeline is not warning me. A: They system warns when an agent's commission paid to brokerage may exceed the agent’s next commission split threshold. 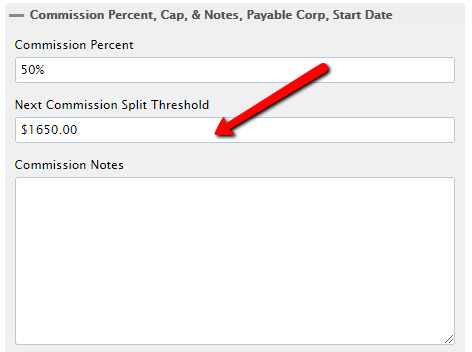 Check to make sure you’re comparing the brokerage’s share of the commission to the threshold.